Here is a list of all the postings Spice Cat has made in our forums. Click on a thread name to jump to the thread. Yes, wasps are vindictive, the sort of taxman of the insect kingdom. I was stung recently at the field by a wasp and having no anti sting stuff, I resorted to a series of wet wipes. They seemed to work remarkably well. Hornets it is and will advise all clubbites to avoid them. Thanks. I couldn't get anything to scale out with and should have said it's about an inch long. Best avoid them I think!! Really not sure whether to go to this. The first was a bit disappointing. Found this and many like it crawling on the oak tree near the pits at our club. 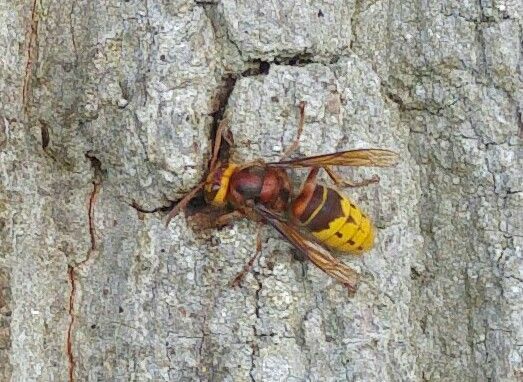 Any ideas what it is and can it sting???? Hey Spicey, what were you searching for to find that one ? You're not going to believe this but it was parts for a Briggs and Stratton mower. God knows what the connection was! That's what l like to see; a quirky sense of reality. No idea what the starter pulls but I can check. As for the breakers it's one of those small ones not a wheelchair battery though. 3s 2650mah. I stress for emergencies only. You forgot the bit where the second American police officer says "Nice grouping"
I recall reading an article about starting a car with a LiPo, but can't remember if it was a spoof or not. The reason this has become top priority is that I have recently inherited a ride on mower with electric start and the battery is a little flaky. Being tight fisted, I don't want to lash out the £50 for a new one so as an emergency back up, can it be started from a 40C 11.1v LiPo?? Not an expert in these things but in this are they SS uniforms, looks like Wehrmacht to me and as for the 'Kubelwagen', looks liks a VW Thing as the fuel filler is a bit of a give away. Can't shout myself. Most days you can't even see the shed. Please read the description of this. Thought I would share some wisdom with you all. Don't strim a patch of stinging nettles when you're wearing shorts. Thanks Pat. Using Taranis in D8 mode. I'll keep a good eye on it. Just re bound it and it seems fine but I will give a full run through. I cannot find the thread but can these be updated?? Don't know if anyone else has had issues with these receivers, but I have had two duff ones so far. The first didn't work from the work go and thanks to getting it from the global HK website, not worth returning it. The second had been working fine two months ago but packed up on Friday. It wouldn't bind and would only work on channels 1,2,3. Anyone else had this problem and is there a fix or should I put a hammer through it??? Denis good to see you back. With regards to cofg I will check again as I did bolt a camera to the front.